If you've been to Disneyland before, you know what to expect, but what you may not know is what's new since then. To help you keep up with the changes, here's a list of new rides at Disneyland and California Adventure. If you don't go to Disneyland every year and need to catch up, you'll also find what was new in the past years below. 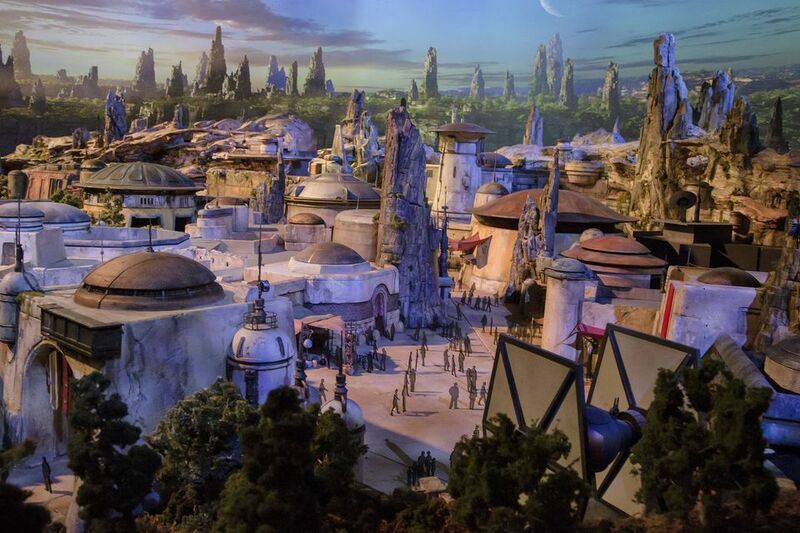 The big event in 2019 will be the opening of Star Wars Land (Star Wars: Galaxy's Edge) is scheduled for summer. You can keep up with the latest news about Disneyland's new Star Wars Land in this preview guide. The new land wiped out Big Thunder Ranch, which closed permanently on January 10, 2017. Experts predict crowds as large as 200,000 trying to get in on Star Wars Land's opening day. Expect even larger than normal crowds for the rest of the summer and probably into the following year, with some people guessing that guests who don't get Fastpasses or MaxPasses could face 6-hour waits for the attractions. A new parking structure is also under construction that will contain 6,500 spaces. You might also want to take a look at Disneyland's Best Rides, Top Rides for Kids and Toddlers, Disneyland's Most Popular (and Busiest) Rides, and Disneyland Roller Coasters. The year kicks off with a celebration of Mickey and Minnie Mouse in honor of Mickey's 90th birthday. It's called Get Your Ears On – A Mickey and Minnie Celebration. You can enjoy special foods, shop for commemorative items and join in Mickey's Mix Magic on Main Street U.S.A.
A new eating location for 2019 is the Tropical Hideaway, a Tiki bar-style establishment which is serving Dole Whips and more along the Jungle Cruise riverfront in Adventureland. Along with Mickey's 90th birthday celebration in the park, you can check up a pop-up experience at the Downtown Disney District called Pop-Up Disney! A Mickey Celebration. It will transport you through a visually and whimsically immersive experience celebrating 90 years of the one and only Mickey Mouse, and his darling, Minnie Mouse. This is a separately ticketed event. In Downtown Disney, you will also find the Ballast Point Brewery which will offer more than 50 styles of beer and a menu fit suited to the whole family. And that's only the beginning. There are also 10 more new experiences you can enjoy, including a bowling alley and new shops. In California Adventure, the former Bug's Land will be surrounded by construction fences and the new Marvel-themed area is being built. Jessie’s Critter Carousel which replaced King Triton's Carousel opens in April. Its new creatures will be based on animals that "Toy Story" character Jessie the yodeling cowgirl might find out on the ranch. Get ready to saddle up on a whimsical snake, armadillo, turtle, bunny and more critters from the world of Woody’s Roundup. A new play area opens with an Inside Out! theme. A new themed area is in the works for California Adventure, anchored by the popular Guardians of the Galaxy – Mission: BREAKOUT! will be joined by Spider-Man and the Avengers in what will become a completely immersive Super Hero universe. Completion is scheduled for 2020. Good news is on the way for anyone who would love to have more hotel options, but it will be a couple of years at least before these projects are finished. The city of Anaheim has approved several new high-end hotels in the Disneyland area. A JW Marriott is under construction. Other projects will replace the 56-year-old Anaheim Plaza Hotel & Suites and the Anabella Hotel near the Anaheim Convention Center. Walt Disney Parks and Resorts has also announced a new hotel project near the theme parks. Disney premiered mobile ordering from fast casual and quick-service restaurants using the Disneyland App. You can choose your food items and pick up time and then just step right up to pick your meal with no waiting. Downtown Disney got some upgrades that include a bowling alley, a multi-sensory Star Wars experience, new shops, and restaurants. A new arrival point called Eastern Gateway will provide guests with more choices for access and parking when it opens in late 2018. It will include a new parking structure with 6,800 spaces, a new transportation facility, and an elevated pedestrian bridge over Harbor Boulevard. At Disneyland, the Pixar Play Parade, which was previously California Adventure’s afternoon parade moved to Disneyland in April, replacing the Soundsational Parade. The monorail got a new paint scheme featuring characters from The Incredibles and Finding Nemo. Main Street U.S.A. also emerged from a refurbishment that replaced the horse-drawn streetcar track. Pixar Pier at California Adventure opened on June 23. It's not a new area, but the old Paradise Pier got a new theme and a new name. The already fun and exciting California Screamin’ rollercoaster becomes the Incredicoaster when it adds a storyline: The Parr family races alongside you, trying to catch baby Jack-Jack! The Fun Wheel experience is unchanged, and the only noticeable change is the characters painted on the gondolas. Nearby you’ll find new midway games based on Pixar films. Toy Story Midway Mania also remains the same but it becomes the center of a Toy Story-themed neighborhood. Ariel’s Grotto closed, replaced by the Lamplight Lounge which serves California casual gastro-pub cuisine and unique signature cocktails. Don’t worry about missing out on those Lobster Nachos which were a popular item at the restaurant’s Cove Bar. They will be on the Lamplight’s menu. A Bug's Land closed permanently in September to make way for the new Marvel-themed area. That means Tuck and Roll's Drive 'Em Buggies, Flik's Flyers, Francis' Ladybug Boogie, and Heimlich's Chew Chew Train are gone — and so is the Bug's Life show. Nighttime show Fantasmic! returned on July 17, with new mist screens and effects. The beloved Main Street Electrical Parade returned from Florida. It was scheduled for a limited run and finally made its last run in late 2017. With the release of the new Beauty and the Beast film, the old Edelweiss Snacks in Fantasyland transformed into the Red Rose Taverne. In California Adventure, Twilight Zone Tower of Terror closed in January. It returned as Guardians of the Galaxy – Mission: BREAKOUT! Also in California Adventure, Cars Land got a seasonal overlay for Haul-O-Ween, with the residents of Radiator Springs dressing up and celebrate Halloween as only a bunch of talking cars can. The Grand Californian Hotel launched a major room upgrade project in early 2017 that made the Grand Californian even grander than ever. You can get a look - and an overview of the hotel's pros and cons in the Guide to the Grand Californian. Two more rides were added to the FastPass system: Matterhorn Bobsleds in Disneyland and Toy Story Midway Mania in Disney California Adventure. Disney MaxPass: In early 2017, Disneyland announced a new way to get FastPasses. It's called Disney MaxPass which you can use on the Disneyland app to get your Fastpasses digitally without the need to walk to a FastPass machine to collect them. Autopia got snappy new cars that Curbed LA says "look like something Magnum P.I. would drive." They're sleek, Honda-branded sports cars in red, black, white, royal blue, silver. Disney surprised many of their fans by announcing that the nearly-new Paint the Night Parade would make its last run on September 5 and both the 60th-anniversary fireworks show Disneyland Forever and the World of Color water and light show at California Adventure Park also ended. The classic Fantasy in the Sky fireworks which dates to Disneyland's earliest days returned. The film Star Wars: Path of the Jedi replaced Captain EO. Jedi Training Academy got a new look. Jedi wannabes need to register to participate. The lower level of the old Innoventions building became the Star Wars Launch Bay and the building was renamed Tomorrowland Expo Center. Space Mountain became Hyperspace Mountain with some new Star Wars-related theming. Star Tours became Star Tours the Adventure Continues. Characters from the latest film showed up in some of its storylines. A new “Frozen” musical replaced the long-running Aladdin show at the end of May. Luigi's Rollickin' Roadsters opened in early March, replacing Luigi's Flying Tires with a more engaging experience. A new film “Soarin’ Around the World” started showing on June 17, the day after it premiered at Shanghai Disneyland. The film follows the same general format as the original Soarin' but features locales from around the world. 2015 was Disneyland's 60th anniversary, with a big “diamond” celebration. At the Haunted Mansion, the Hatbox Ghost returned. He shows up just after you leave the attic, and has a fun effect that involves his head and the box. At Matterhorn Bobsleds, the abominable snowman got an upgrade that made him more realistic. Peter Pan emerged from refurbishment with some newly added effects. A new seating system premiered for the Fantasmic! nighttime show, with reserved viewing areas that require a Fastpass, similar to the way World of Color operated since it first opened. The Disneyland Forever fireworks show and Paint the Night parade dazzled visitors during the diamond anniversary, but both were retired after that. World of Color: also got a new storyline but went back to its previous format afterward. Mad T Party at California Adventure got a new look. 2014 brought only minor changes and additions. After what seemed like the longest refurbishment in Disneyland history, Big Thunder Mountain Railroad reopened, with a new, silky-smooth track and a fun new ending. Longtime musical act Billy Hill and the Hillbillies played their final day of performances at Disneyland Park on January 6, 2014. No major updates happened at Disneyland and California Adventure in 2013. Fantasy Faire moved to a new home near Sleeping Beauty Castle. It gives princesses and knights of all ages a role in a charming storytelling experience and a nicer place to meet and greet their favorite Disney princesses. A new show called Mickey and the Magical Map also opened at the Fantasyland Theatre. For the first time in 20 years, new music was playing as you entered Main Street U.S.A.
Matterhorn Bobsleds got new cars, with three seats per car, two of them linked together to accommodate six guests. And after a long hiatus, the mountain climbers came back. Disneyland hotel renovations completed, with new guest rooms, pool area, and dining options. Old and New at California Adventure: Goofy's Sky School, the classic "mad mouse" roller coaster that opened as Mulholland Madness took on a flying academy theme with Goofy as the instructor.